Save the date on your calendar now! Watch the video about The Hungry Lion Bike Tour! 8:30 Big Wheel Flyer (75 miles) This is a 2 loop ride! Loop 1 travels south along the North River for 20 miles before turning back north to climb back up to Town Hill. Loop 2 then picks up the 35 mile Rowe Zipster ride. 9:30 Two Rivers Ride (55 miles) This is our classic 55 mile ride that follows the North River south to Massachusetts and then picks up the Deerfield River to head north back to Vermont. 10:30 Rowe Zipster (35 miles) A fabulous downhill with a rolling ascent back to Town Hill. 11:30 Twin Lake Tour (10 miles) Our shortest ride can still challenge, but a beautiful, pastoral tour with a stretch of dirt for those who ride FAT, Mountain and/or Cross bikes. ﻿(No skinny tires) If you want to be a part of the festivities and are limited on time - or just want the most easy going of the Hungry Lion tours - this is for you and your friends! Skip the two-mile climb out of Readsboro in our special Lion Tamer Shuttle and pedal the last 4 miles to the BBQ. Ask at the Readsboro rest stop! Available on all three of our longer rides. Early Entry Fee: Why wait? Sign up now for only $50. Prices increase throughout the year, so sign up today. 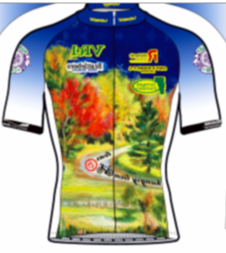 The HLBT Jersey: Raise $250 in sponsor donations and earn the beautiful custom Hungry Lion Bike Tour Cycling Jersey! This special thank you is yours to wear proudly throughout the cycling season, and it probably won't take as much effort as you'd think. Special Prizes: We always have great raffle prizes which all riders have a good chance to win! Your bike and ALL participants must wear a helmet!! Rest stops will be provided where riders can fuel up and hydrate. Stay for the post-ride BBQ, Band & Awards ceremony at beautiful Town Hill!